Description: The Armor of Gaia is a large suit made of a special metal that has a brown coloring, it stands nine feet tall and weights a ton, the suit of armor is covered with tubes of all kinds that are made to be super hard to break. 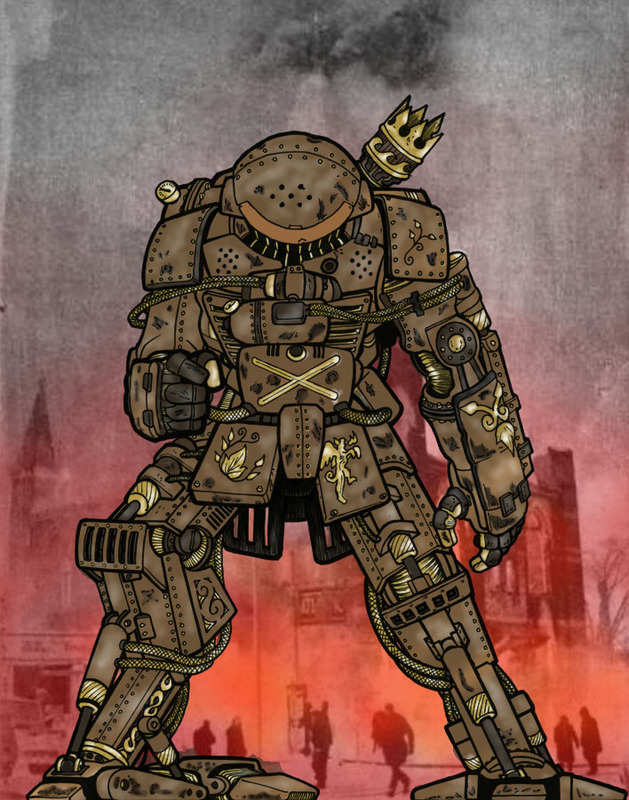 The tubes are filled with steam that is used to move the machine, it has golden markings all over it that give it some protection against magical attacks since magic is always being used to harm people, the machine also comes with a small fire cannon that is used for ranged attacks. Enchantments: It gives her enhanced resistance to both water and fire as both deal out 25% less damage. Though lighting and ice deal her 25% more damage. History: The Armor of Gaia was developed by Washu back when she first turned into a twelve year old out of the idea that she might need her own personal weapon to use against anyone that tires to harm her, she had the same problem with it as she did with the Steam Golem's though as the energy needed to keep it running with normal energy sources would cause the nation of Glasine to do even more damage to their environment which Washu did not want to have happen. When Advocat came and helped fix up the Steam Golems he did the same for Washu's Armor of Gaia as a thank you for her making such wonderful little toys for him to use, with the demon now inside of her suit of armor she was finally able to operate the machine and test it out. She studied the fire demon as well to see how she could tap into is powers and learned that it could be used to give her magical abilities, though of course it requires that she be inside the suit of armor to do so. With that though she now had a new weapon to use and thus the smallest, youngest, and smartest inventor ever also became the most dangerous. What kind of Strength boost are we looking at? Strong enough to throw bounders. No, I mean, how much more Strength does she have as compared to her being out of the armor? How much is her Strength improved by this? When she is out of it, she stronger than any normal 12 year old. more on par with that of a mage or something that is grown up, but those that are known for their strength *warriors, knights, and the like* are obviously stronger than her due to them being older, bigger, and trained to be strong. So, what, the Armor lets her fight as a Warrior would? Normally, I'd say it could only be 20% w/o MP. But, you are weakening other stats to pull this off. How much slower is she? How much slower are her attacks? How much less evasive is she? slower as in 50% slower than a normal person, and her reaction time is 20% slower. I think Evasive goes hand in hand with speed and reaction time, so not sure how to put that. BUT, remember, she's a 12-year-old girl. Even doubled... That ain't much.